Reminds a lot of a Belgian Strong ale. Malty with raisins, figs and caramel but differs for me in that it seems a little hot from the alcohol and a little too bitter to be well balanced. It is pretty good but the weird aftertaste and heat kind of make it less likeable to me. Pours a cloudy dark brown with creamy, dark tan head. Immediately hit with strong aromas of spice, caramel, and a bit of smoke. Unfortunately, the beer is quite a bit sweeter than I'd like; a syrupy caramel. However, it is very smooth and I do not notice the major ABV it's packing. It's also quite drinkable, going down smoothly. I'd drink it again if I was in the mood for a simultaneously sweet and dark beer. Notes: Labeled 9.5% ABV. Cloudy Russet, short creamy yellow-tan head. Malt aroma with alcohol and some dark skinned fruit - not sharp, dull... raisin, fig. The flavor is fuller but follows. The impression of dark fruit skins seem to over-ride the dark fruitiness, I'm guessing because of the bitterness, and then there's a central caramelish malt component and an outside alcohol note. It's moderately toffee-ish. Medium full body with a median carbonation. Certainly not the best eisbock I've ever sampled, but pleasant enough. Appearance: Pours an amber-brown body, good clarity, with no apparent head formation. Smell: A simple, lightly scented trace of bready, caramelly malts, then, a bit of fruitiness and sniff of booze. It's just not particularly inviting or appealing. You just want to quietly, carefully pour it back into the bottle and dismiss it as you push it aside with your hand, moving on to something else. But, we've come this far, let's press on! 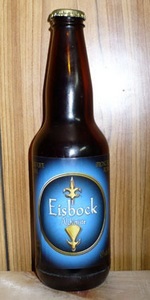 Taste: Well, huh, there's oddly very little flavor for a purported eisbock, though it's no surprise after the underperforming aroma. A touch of toast, very mild, with faint hints of herbs, apricots, and tangelos. Drying, warm finish. You're in and out in a flash, as there's not much going on in there. Overall: Unlike any eisbock I've previously encountered, in that it's totally lacking all the rich, complex maltiness and potent, pleasing flavors one would expect and hope for. If this is the concentrated, post-freezing results, I'd be curious to see what the heck they started with. A - Pours a dark amber with mild carbonation. Bright. Half finger off white head. No lacing and a film of retention. S - Caramel, dark fruit, brown sugar. T - More caramel and fruit with a little less sugar. Some yeast in the finish. Not bad. M - Good carbonation and a full, chewy body with a sweet finish. O/D - Not too shabby. Not overwhelmingly good but good enough to keep your attention. A- Dark brown and ruby tone with frothy head that has nice retention and creamy lace. S- Strong, bold and fruity. Sweet toffee and toasted grains, hints of booze, earthy notes, and cherry tones; other dark fruit. T- Toffee, brown sugar, rich sweetness. Fruit notes are prominant with cherry, dates, plums, and raisins. Biscuit and toasted grains underneath and a hint of booze well hidden under the sweetness. D- Very sweet and slick with a booze burn makes this delicious beer a sipper. Big thanks to MasterSki for the gift. A - It pours a rustic russet hue, with a surprisingly lustrous head. The froth recedes to plentiful wisps of pancake batter foam. S - The aroma is better from afar, where it seems spicy and sweetly malty. Up close it reveals too much naked grain. The malt is slightly toffee-ish, and tends toward spicy more than sweet. Herbal hoppiness is apparent. M - Fairly lively, and not syrupy at all... still it is fairly uninspiring. D - Pretty good stuff, not great. The well-hidden ABV is commendable.